Miele engineers have been resistant to the idea of bagless vacuum cleaners, and the new Blizzard CX1 bagless vacuum is a giant shift. Although the consumer cost savings of eliminating the ongoing bag replacement expense was undeniable, Miele’s hesitation to make the switch was also logical. You see, though some bagless vacuums enjoyed silent operation, and some high end products generally had good suction, air quality remained problematic for the majority of bagless vacuums. Miele was hesitant to release a bagless vacuum cleaner to the market knowing that many households, especially the ones with infants, young children, and allergy sufferers, were dependent on its clean-air-technology. AirClean filter: effective filtration for everyday needs. Which provides >99.9 % dust retention capacity in combination with the HyClean dustbag. Active AirClean filter: Which provides significant reduction of unpleasant odours, and is ideal for pet owners. HEPA AirClean filter: Which provides >99.999 % dust retention capacity, filters even fine dust and allergens, and is ideal for those with house dust allergies. It was not easy to improve on the cyclonic separation technology, which was first introduced in 1970's by none other than Sir James Dyson. After years of research and testing Miele is finally releasing their version of cyclonic separation, and have dubbed it the "Vortex Engine", and it is one of the components that make Miele bagless vacs so remarkable. The Vortex Engine generates a cyclonic air flow in excess of 60 mph - an impressive speed in such a small space! At this speed, you can be assured that the fine dust will be separated from the debris. You will appreciate the Vortex Engine technology the most when you are emptying the transparent debris container: there will not be any dust escaping to the air! Which means that you will be spared from the trip outside your house to empty the container, and family members will not have to pull out their asthma inhalers. Wait, so, where does the fine dust end up? The fine dust gets trapped in the GORE filter. Remember the company that brought you GORE-TEX coats? The GORE filter is a lifetime filter that is tucked away in the body of the machine, which you can remove and wash with water (yep, it's that simple!) when needed. Miele bagless vacs also have an exhaust filter for trapping any final remnants of dust, and captures 99.5% of particles. Higher-end models feature a HEPA AirClean filter that removes 99.999%* of allergens and particles (* According to EN 60312-1). Both exhaust filter types are maintenance free with lifetime operation. If you weren't already convinced that Miele's bagless vacs had provided the best in air filtration, Miele's hygienic method of filtration gained the favorable acclaim of the world's leading independent filtration testing agency IBR Laboratories. Most of us want to be thrifty with our time and resources. In the case of a bagged vacuum, this thriftiness tends to mean that we hold on to the old bag in the vacuum cleaner until it's absolutely necessary to change it. By that time, the bag is usually filled to the brim and, in addition to creating an unpleasant bag-changing situation, a completely full bag will also compromise even the strongest motor's ability to generate the suction needed to get the floor clean. Cyclone vacs have a transparent, easy to empty container, which helps to ensure that suction will always be at it's best by working with your natural inclinations: you vacuum, you see the dirt in the container, you empty the container, you pour yourself a glass of wine in celebration of a clean house, and a job well done. Oh, and you saved some money, too! #hero. Miele's vacuum cleaner motors have always been a hallmark of the product, maintaing suction, year over year. So much so, that they have a 7 year suction guarantee on all of their vacuums and a 10 year warranty on their exclusive HomeCare line. Multi-function rotary dial: The suction power is regulated by turning the rotary control to the floor type desired. You will be amazed by the silent operation of this vacuum! Given the power of the Vortex Engine, Miele was able to keep the noise levels consistent with what you've come to expect from of their previosly existing bagged vacuum line up. SEB228 Electrov+ Power Brush: Turbo brush agitator powered by electricity: great for any carpet type or for families with pets. Vacuums with SEB228 come with the ergonomic comfort handle with controls to turn on/off the turbo brush agitator (aka the beater bar as our parents say). You are able to adjust the distance of this floor head from the surface with an easy foot-switch. STB305-3 Air Driven Turbo Brush: Agitator brush powered by air movement: great of low to medium pile carpets. SBD285-3 Suction Only Floor Head: Ideal for Hard Floors, Silk Rugs and Low Pile Carpets. Let's you operate from surface to surface without changing heads. This tool does not have the agitator brush. There are so many wonderful details on these vacuums that truly revolutionize and enhance the task of vauuming. Handle controls so that you can turn the turbo brush on and off to regulate suction power with your fingertip. Comfort power cord rewind with tap function: No need to stop and wait and hope the cable rewinds without tangling. A simple tap on a foot switch is enough to comfortably rewind the entire cable of the Blizzard CX1. Extra long power cord: Thanks to a range of 33 ft., large rooms can be cleaned comfortably without having to change sockets frequently. Helpful park system for vacuuming breaks and storage: Easy to park when you attach the floorhead to the canister in the specified positions. The park function for pausing during cleaning is on the left of the vacuum cleaner. To store the appliance upright there is another park function on the back of the vacuum cleaner. Rubberized caster wheels for smooth gliding move: Blizzard CX1 is equipped with four durable 360° non-marring castor wheels that provide an extra smooth, luxurious maneuverability and special floor surface protection. Attached acccessories: Accessories are all tucked away so they are there when you need them and not hidden in the corner of a dark closet. "Comfort Clean": Let's you know when the GORE-filter needs to be washed. No Overheating: Thanks to the thermal switch which powers off the vacuum cleaner in the unlikely case of overuse. So Then, The Blizzard CX1 Cyclone Vac is Good? It's outstanding! 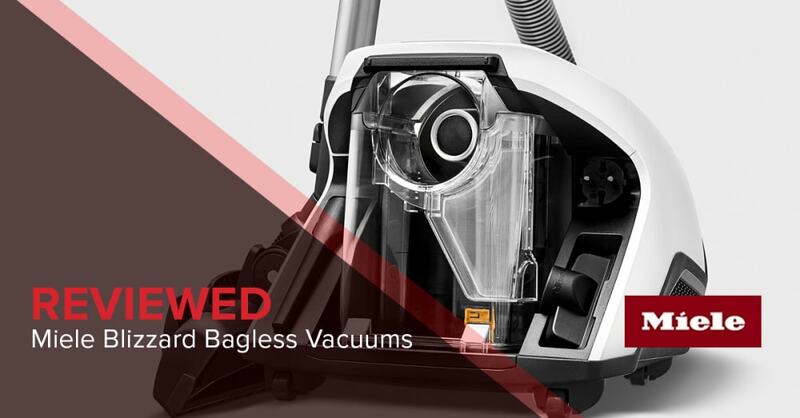 The hygienic air-filtration system is enough to put this bagless vacuum in a class of it's own. When you add in the guaranteed and superb suction action, the quietness, and all the extra features and accessories, you get a vacuum that provides a superior clean, as well as an ease of use that will allow you to spend less time worrying about the dust in your home, so you can have more time doing what you love in your home. Which model shall I purchase and how? Simply follow the links below to make your purchase on [Designer Appliances](https://www.designerappliances.com/catalogsearch/result/?order=sort_value&dir=asc&q=blizzard and get your delivery via Fedex overnight with Free Shipping. Pure Suction Model for area rugs and smooth floors although a smoothfloor tool comes as a stand alone accessory this vacuum is designed for those of us who don't want to think about changing floor-heads. $499 price point makes it extra attractive. This model is sold only in authorized Miele stores.